To start off, chicken is marinated in a hoisin, white vinegar, soy sauce, sugar, cornstarch and water mixture. This mixture for the marinade also doubles as a sauce, which is a great time saver. The General Tso's sauce is then made by sautéing garlic, ginger and red pepper flakes until fragrant. When you're ready to batter the marinated chicken, each piece of chicken is tossed in foamy egg whites and dredged in a mixture of cornstarch, flour, baking soda and a touch of the hoisin mixture just before frying. The egg whites produce a fluffy breading around each piece of chicken while the cornstarch allows the chicken to fry up nice and crispy. Once the chicken is all golden brown with that perfect crisp coating, the chicken pressure cooked with the reserved sauce. If you want additional texture, the chicken can be broiled until your desired crispness before serving. 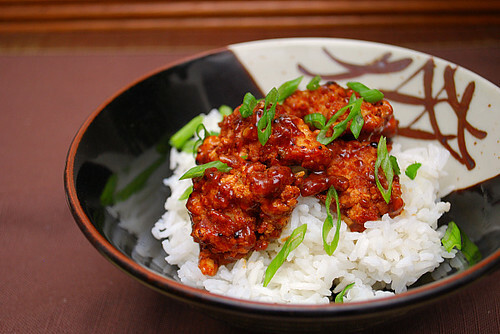 The General Tso's sauce adds just the right amount of sweetness and very subtle heat (from the red pepper flakes). We loved this over steamed jasmine rice and garnished with a few fresh slices of green onions. While the chicken is chilling in the marinade, plug in the IP with insert set in place. Press MANUAL on the IP and add 1 tablespoon oil. When shimmering hot, sauté the garlic, ginger and red pepper flakes until fragrant. Add 2 cups of the reserved hoisin marinade to the IP, whisking constantly, until the mixture is dark brown and thickened. Remove from heat, cover and keep the sauce warm. Clean out IP insert, dry and return to IP. Press SAUTE and add 1/2 cup oil for frying. Meanwhile, prepare the chicken coating by whisking the egg whites in a shallow dish until foamy; set aside. Combine the cornstarch, flour, and baking soda in a second shallow dish; mix well. Remove the chicken from the refrigerator and discard marinade. Pat the marinated chicken dry with paper towels. Toss half the chicken into the cornstarch mixture. Next, dip chicken into the foamy egg whites until well coated, then dredge the chicken in the cornstarch mixture once again, pressing to adhere. Transfer the coated chicken to a plate and repeat with the remaining chicken. When oil is hot in the IP, fry half the chicken until golden brown, about 3 minutes, turning each piece halfway through cooking. Transfer the browned chicken onto a paper towel lined plate to drain. Repeat with the remaining chicken. Add the reserved hoisin sauce and cooked chicken back into the IP. Garnish with sliced green onions and serve with rice or noodles.